All of the following baskets follow a basic format. Get a container and fill it with a variety of theme-related items. Always include one large item and lots of related smaller gifts. Use tissue or other filler to keep everything in place nicely. Gift wrap it, or enclose it in clear or colored cellophane, and top with a big bow! I've listed more ideas for gifts than you will need for any listed container; you choose how much you want to include. Fill the container with bibs, rattles, a plush toy, a larger plastic toy, a soft bath towel, a hand-knitted blanket, socks, a nice hand lotion for mommy, a bottle of champagne and two flutes, a 3-month subscription with a diaper service, a hand-made coupon for a night's free baby-sitting, a DVD of a children's classic movie, or a favorite story book. Fill the container with a tin of home-made cookies, a collectible tree decoration, some red candles, a favorite seasonal candy (like peppermint bark), some hot chocolate mix, a set of holiday mugs, a DVD of a holiday classic movie, a decorative trivet, a bottle of mulled wine, a CD of holiday music, a decorative picture frame, holiday kitchen or guest towels, holiday drink coasters, seasonal potpourri, or a set of appetizer plates. Fill the container with your favorite BBQ sauce, some tins of meat rubs or bottles of marinades, an assortment of imported or craft beers, a set of BBQ implements (tongs, fork and spatula) with long handles, an outdoor grilling recipe book, astroturf coasters, some outdoor candles in glass containers, a fly swatter, a red-and-white checked tablecloth, a decorative beer opener, some sunscreen, a package of invitations to a summer party, a set of one-use bamboo plates, a beach ball or a badminton set. Fill the container with oven mitts or potholders, a garlic press, some jars of spices like oregano and smoked paprika, soothing hand soap, a set of different sized wooden spoons, a recipe book, measuring spoons and/or measuring cups, a microplane, a utensil holder for the counter, a grocery gift certificate, a decorative kitchen timer, a good quality cutting board, a good quality knife or potato peeler, a large colander, colorful funnels, a box of band-aids, or large kitchen towels. You could also focus your theme around the recipe book you include. If it's a book of soup recipes, your gift items could include a soup serving pot (the container) and ladle, a set of soup bowls, bullion cubes, a jar of bay leaves, some peppercorns, or a salt cellar. Fill the container with candy bars, of course, but how about adding some plastic eyeballs, a set of different paste-on mustaches, a plastic skull, some plastic spiders and flies, a couple of wigs (a clown wig, or a mohawk wig, for example), a scary-story book, a classic DVD movie, some high bounce balls, pretzel sticks, black nail polish, a very large bag for trick-or-treating, a feather boa, or a crown? We hope these five ideas have started you thinking about what you'd put into a gift basket. 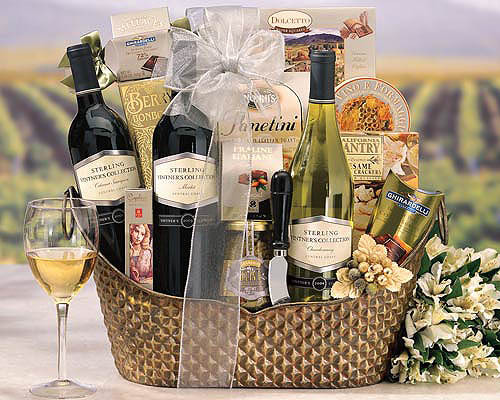 If you've assembled a successful gift basket, we'd love you to share your ideas with our readers, below!